Mahi mahi is a meaty fish with a mild flavor. It holds up well to marinades, but it is also delicious in a simple grilled or baked preparation. The wine you pair with it will depend largely on how you prepare the fish. Because the flavor of mahi mahi is delicate, you don't want to overwhelm it with the wine you choose. Hearty reds won't work with this white fish. Instead, choose a light, aromatic white wine. Sauvignon Blanc is a dry, herbal white with a highly aromatic quality and light character. Because of this, the flavors and aromas will add interest to the lightly flavored fish without overpowering it. If you use herbs to season the mahi mahi, this wine is perfect, as well. This spicy and aromatic dry white from Germany has a lovely nose. The spices in the wine blend well with the fish without overpowering it. Chardonnay wines come in oaked and unoaked varieties. The oaked version is fragrant with vanilla and toasty flavors that will complement the slight char flavor that accompanies grilled fish. Chardonnay is a dry white, and it won't overpower delicate white-fleshed fish flavors. If you pair your mahi mahi with a creamy sauce, you'll want a wine that has some acidity to it to cut through the heaviness of the cream sauce. Vouvray traditionally comes from France's Loire Valley. It is made from Chenin Blanc grapes and occasionally contains Arbois. Vouvray is crisp and floral with herbal notes. It also has tremendous acidity, which can help balance the fattiness of a cream sauce. Made from the Pinot Noir grape, Champagne is often a lovely balance of acidity and toastiness. This combination balances cream sauces beautifully. These two wines come from the same grape. France and Oregon call it Pinot Gris while Italy and California call it Pinot Grigio. This dry wine often has tree fruit flavors like apple, along with a hint of minerals. With nice crispness to the wine, it's the perfect balance for mahi mahi with a cream sauce. When pairing wine with mahi mahi that has a bold tomato-based or salsa type sauce, pair the wine to the sauce instead of the fish. Otherwise, the flavors of the sauce/salsa may overpower the flavors in the wine. German Riesling is crisp, acidic, and filled with tropical flavors and spices. This makes it the ideal wine to pair with a spicy fruit or tomato-based salsa. Choose the Riesling in a Kabinett or Spätlese level of sweetness, which won't be overwhelmingly sweet or cloying. Rosé wines are made from red wine grapes left in contact with the skins for a short period of time, giving the wine a light to medium pink color. These wines tend to be slightly crisp and mildly tannic, with floral or tropical flavors that work well with tomatoes and salsa. For a tomato-based salsa, try a rosé of Sangiovese. For a tropical fruit salsa, try a French rosé. A light-bodied red, Grenache has earthy and smoky flavors that hold up well to the spices in the salsa, but it won't overpower the fish. You can also try a Garnacha from Spain, such as a Priorat, which is essentially the same grape with a different name. 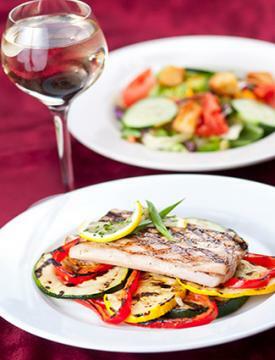 Pairing the right wine with mahi mahi dishes is a matter of personal taste. While the wines listed above offer a good guideline, feel free to pair a wine you enjoy with a food you enjoy for a meal that's certain to satisfy.